The title of this video is a bold statement. 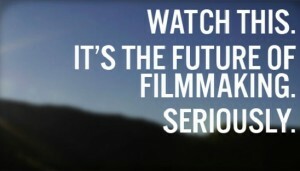 “The Future of Filmmaking” is not something just anyone claims to be a part of. But I think the folks at Seed & Spark are onto something with their idea. The founders of Seed & Spark take a different look at Crowd funding, distribution, film revenue and finding cool films. Check out the video below and consider supporting this fantastic outfit and service! The Future of Filmmaking from Seed&Spark on Vimeo. We’re the most unlikely group of filmmakers, the lot of us. We started Seed&Spark because we want to make films but we needed a healthier environment in which to make them. We believe the art of storytelling is about expanding imagination, shining a light on the world inside and deepening empathy for the world outside. In the current social climate where many consider the arts a luxury, we believe artists are responsible for teaching their audiences why they are essential. We also believe films are not just art, they are business ventures. They require the seed of an idea and the sparks of human and capital investments to bring them to life. Yet the film business has grown removed from what it really is: playing make believe. That’s something we all know how to do. The make believe we played as children was essential to our development: brains are firing on the most cylinders when the imagination is stimulated. It’s creative, inclusive, expansive, and playful. We want Seed&Spark to be a platform that reflects this spirit, expanding the space for more, different kinds of stories to be told. With an audience’s early support, a storyteller is emboldened to take greater risks. With the storyteller’s passion, the audience is enticed to become included in the process. Together, they create an ecosystem for truly independent film!